At an Graceland auction an acetate turned up, featuring Elvis' recording of "I'm left, you're right, she's gone", including a previously unknown false start. Here's a thought exercise. As rock-and-roll fans descend on Graceland for the double celebration of Elvis Week 2018 and the 50th Anniversary of Elvis' "'68 Comeback" TV special, try to imagine what Memphis might be like today had Singer Presents ... Elvis (as the career-defining NBC special was officially named) been a wholesome Christmas variety show instead of the juggernaut rock and gospel performance that it was. Imagine if Presley's manipulative manager, Colonel Tom Parker, had gotten his way: There would have been no iconic black leather suit. There would have been no gospel medley backed by Darlene Love and the Blossoms. And no reunion of Elvis and his original Sun Studio guitarist, Scotty Moore and drummer DJ Fontana. If the Colonel had gotten the TV special of his dreams, the alleged King of Rock-and-Roll would have crooned his way through seasonal favorites like "I'll Be Home for Christmas" and an old Frankie Laine song called "I Believe." "To this day, I don't know why he thought 'I Believe' was a Christmas song because it's not," says the show's producer/director Steve Binder, in recounting his first awkward encounter with Parker. Binder had been a logical pick to handle Elvis' return to TV, having helmed the landmark The T.A.M.I. Show, a 1964 rock and soul concert film with a dozen emerging British and American acts, including The Rolling Stones, James Brown, The Supremes, The Beach Boys, and Marvin Gaye. Still, credentials aside, the young director had to make a good impression on ths Colonel. Otherwise the manipulative Parker wouldn't permit a private one-on-one meeting with Elvis. "I truck out to MGM Studios, where Elvis had just finished a movie, and where the Colonel's offices were," Binder told the Flyer in a recent telephone interview. "And the Colonel hands me a quarter-inch audio tape of 20 Christmas songs that Elvis had recorded and sent out as a gift to disc jockeys all over America as a present. It's got a picture of Elvis surrounded by holly and berries. He told me, 'This is the show that NBC and myself have decided on.'" "In my head, instantly, I knew this was a show I'm not going to do," he says. "So I wrote off the meeting. Drove back to my offices on Sunset." By the time Binder arrived back at an office he shared with his partner, music producer Bones Howe, there was a surprise message waiting for him: "Elvis is going to be in your office tomorrow at 4 p.m."
"If you're looking for trouble, just look right in my face," Presley snarls in the tight opening shot of Singer Presents ... . And it's not like the audience watching at home ever had any real choice in the matter, since the singer's famously sullen mug is framed in an extreme close-up, floating in pitch black background with just a splash of red at his throat. This is nobody's Christmas show; it's Elvis daring fans and critics alike to judge him — to gaze into the bright, blue, bedroom eyes of a massively disruptive artist from the previous decade, and determine whether or not he was still the rebel rocker from Memphis, or if he'd become Hollywood's toothless Teddy bear, cranking out another round of cheap, non-threatening product. You'd never know it to look at him, as the camera pulled back and the tune changed from Jerry Leiber & Mike Stoller's "Evil" to Jerry Reed's "Guitar Man," but nobody wanted to know the answer to this question more than Elvis. "What if it fails?" Elvis asked Binder during the first closed-door meeting with his new director. Money for making Elvis movies was drying up, and the special had only come about in the first place as part of a deal the Colonel had struck with NBC while seeking backers to make more. "If it fails, your career is over," Binder answered, bluntly. "Nobody will forget the success you had in your early recording career and your movies, but TV is instant. The minute you appear on TV, everybody has an opinion the next morning. If you're successful, all the doors will open and you'll have any choice you want. But it's a gamble, and I can't promise you it's going to be successful." Presley distrusted TV. The medium had burned him in the past, abetting the moral panic that followed rock-and-roll's big bang in the 1950s. But he was also frustrated in his role as King of B Musicals. He trusted Binder's unvarnished answer and felt comfortable in the director's office. Gold records on the wall, from Howe's work with groups like The 5th Dimension and The Association, made Elvis feel comfortable enough to drop an unsurprising confession. "The recording studio's my turf," he told Binder, allowing that he'd always felt more at home behind a microphone than in front of a movie camera. "You make a record," Binder said. "I'll put pictures to it." Elvis had one personal request. He wanted to put "These Boots Are Made for Walking" arranger and session guitarist Billy Strange in charge of the special's music. Binder agreed instantly. "This was really the first thing Elvis did outside the womb," Binder says, explaining why he didn't hesitate in regard to his star's one major request. "[Elvis] joined our world instead of me joining his." There was one small problem with Elvis' first choice though. Strange was working on an album with Nancy Sinatra, and the studio was pressuring him to complete it as fast as possible. When, after several prompts, the over-extended Strange still failed to deliver Elvis' lead sheets in time to start rehearsals, Binder fired him. "You can't fire me," Strange told Binder. "I've known Elvis a lot better and for a lot longer than you." "Fine," Binder answered. "Then I'll be gone and you'll be there. But one of us is not going to be there." Colonel Tom backed the original plan and said Elvis wouldn't show up for rehearsal if Strange wasn't there. Nevertheless, Binder moved forward, convincing New York composer/conductor Billy Goldenberg to take over. "That changed Elvis' musical life, period," Binder says. Before that, Elvis had never sung live with an orchestra before. He'd go into the studio to record movie soundtracks with his rhythm section only. Then, additional musicians would be brought in to overdub all the parts. "He loved every note he heard, and he bonded with all the musicians," says Binder, who hired Phil Spector's favorite studio musicians, the Wrecking Crew, and brought in The T.A.M.I. Show and Shindig alums the Blossoms to sing backup. Blossoms singer and Rock-and-Roll Hall of Fame inductee Darlene Love remembers meeting Elvis in the recording studio. "That's where we met Elvis and became friends with him," she told the Flyer. "Especially me because of my gospel background." During spare moments, Elvis, who'd already cut a pair of acclaimed gospel albums (How Great Thou Art and His Hand in Mine) grabbed his guitar and asked the Blossoms what their favorite sacred songs were. "We'd be over in the corner with Elvis just having a good time, and I think sometimes everybody got a little bit angry with us for taking all of his time," Love says. "He loved what he called 'the hymns of the church.' Songs like 'Precious Lord Take My Hand' and 'Amazing Grace' and 'How Great Thou Art.' He would sing the leads and we'd do the background. He would ask us, 'Is this key all right?' And you know, whatever key it was in was all right with us." Binder was fascinated with the Elvis he saw backstage, singing with the Blossoms or casually jamming in his dressing room with friends. "I said to myself, instantly, this is better than all the big production numbers we're doing on stage," Binder recalls. "We've got to get a camera in there." But the Colonel, still expecting "I'll Be Home for Christmas" to show up in the set, inserted himself again. He wouldn't allow cameras into the dressing room under any circumstances. "It was insane," Binder says. "This was the magic! I knew if we were putting out a disc, this is the one that would go platinum. So I just kept pounding the Colonel and hounding him every day. And finally he broke down. I don't think he was happy that he did it. But he said, 'Okay, Bindel [sic], if you want to recreate it on stage, you can try that. But I won't guarantee it'll get into the show.'" "I don't think they realized that part was going to be so big," Love says of the musical improv reuniting Elvis with Moore and Fontana on numbers like "That's All Right Mama." When Singer Presents ... first aired in 1968, it was an hour special cut down to about 48 minutes for commercials. Ratings were gigantic. "It was the first time, in primetime, that one guy did the whole show himself without guest stars," Binder says. Though he still had a few feature films left in him, Singer Presents ... marked Elvis' transition away from Hollywood and a return to his roots, touring and recording. He'd take lessons learned from the TV special on the road with him, all the way to Vegas. Recently, there was a loud buzz about the Elvis era finally drawing to a close. Las Vegas was losing interest. First-generation fans were dying, changing the market, as rare collectables became less rare. The Sun Records television series failed to earn a second season. But 2018 brought a pair of critically acclaimed documentaries — HBO's exhaustive two-part The Searcher, and Eugene Jarecki's identity-obsessed The King. And between its fancy new facilities and the most ambitious Elvis Week schedule in the event's history, Graceland also seems to be ready for another closeup, daring us all to look Presley in the eye one more time. Binder, Billy Goldenstein, Darlene Love, and other artists connected to the "Comeback Special" are coming to Memphis to participate in Elvis week events at Graceland. To read the full interviews with Steve Binder, Darlene Love, and Elvis friend and country hitmaker T.G. Sheppard, see Memphisflyer.com. It's the 16th so I just wanted to give you a reminder that today a new edit (I believe) of the '68 Comeback Special will be shown in cinemas. Yep, got the tickets and we're excited about seeing Elvis on the big screen tonight! The theater audience was at least 80 percent female, and they really got into it. The number that got the most response was "Trying to Get to You," we ladies were going crazy lol. singing was great, as were the choreography and karate chops. Don't know how Elvis could have looked better . This is scheduled to be shown again in US theaters (and others?) next Monday. I highly recommend it. The show lasts 1 hour 45 minutes. There is an intro featuring director Binder and Priscilla Presley, followed by the broadcast, then some funny outtakes. Thanks for your report I'm glad you enjoyed it. Yeah, "Tryin' to get to you" is a killer performance. I really couldn't decide which performance of that song is my favirte, the '68 special version or the one from the '74 live album (in Memphis). The sit down shows are fantastic anyway. In fact the only parts of the comeback special (and the unused footage) that I don't care very much for are the two stand-up shows. Those big band arrangements sound terrible to my ears. There are a couple of cool performances but most of it is not as good as it could have been imo. Those sit down shows are rock and roll at its primal best. One day, I walked into my local bank, and they were playing it on the in-house monitors. I've seen it dozens of times, but still couldn't take my eyes - and ears - off it. Even in 77, Elvis sang Trying to Get to You great. Seemed to have been one of the few early songs he never lost his passion for. Well, I really liked the movie and still think it is a great documentary on Elvis. But the extras on the DVD (including the special edition) are disappointing. Why not use all the unreleased footage the producers acquired? I found this article about the Comeback Special on vanityfair. Elvis Presley reportedly got more than a little shook up while recording his iconic 1968 TV special, the show that marked his triumphant return to music after years of increasingly iffy films. According to Steve Binder, who directed that landmark television event, the evidence was there when the King came backstage after filming—and costume designer Bill Belew, while drying the star’s perspiration-soaked outfit, discovered that Presley had orgasmed into his black leather pants. 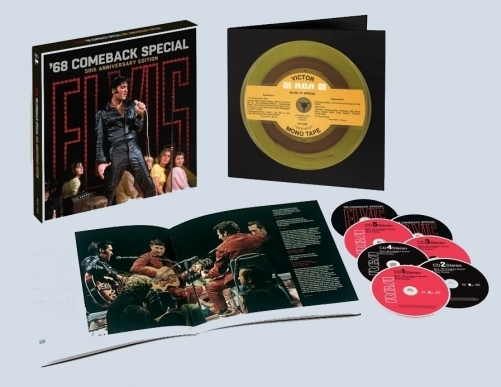 Binder will provide less salacious, but no less illuminating, behind-the-scenes details about the making of Elvis, the singer’s so-called “Comeback Special,” in a newly filmed conversation with Priscilla Presley—part of Fathom Events’ 50th anniversary presentation of the special, in theaters August 20. 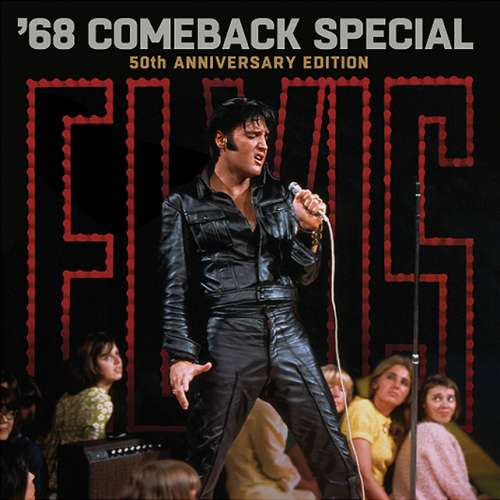 He has also written a definitive book about the event, Comeback ’68: The Story of the Elvis Special, which will be available in September. Elvis looms large in the singer’s legend. The live-wire special is featured prominently in two 2018 documentaries, Eugene Jarecki’s The King (now in theaters) and Thom Zimny’s The Searcher (on HBO). It capped a decade in which Elvis could mostly be seen only in the movies, and, increasingly, not very good movies at that. Taped in June and broadcast on December 3, 1968, it was his first television appearance since 1960, when he guest-starred on Frank Sinatra’s Welcome Home Party for Elvis. At the time, he hadn’t performed in front of a live audience in seven years. Susan Doll, author of Elvis for Dummies, agreed. “I think it’s the peak of his career,” she said. Col. Tom Parker, Presley’s infamously controlling manager, had promised NBC a one-hour special if the network financed Presley’s next film—Change of Habit, Presley’s screen swan song, released in 1969. He never told Presley about the deal, with good reason: “Elvis didn’t want to do television,” Binder said. “He felt he had been burned by it.” Even Steve Allen, the talk-show host hip enough to give Lenny Bruce a shot on prime time, forced cheese on Presley, putting him in a tuxedo to sing “Hound Dog” to an actual hound dog. Presley’s reputation wasn’t helped by the culture surrounding him. In a turbulent year that witnessed rioting in the streets during the Democratic National Convention in Chicago and the assassinations of Martin Luther King Jr. and Robert Kennedy, Elvis had begun to seem over the hill at the age of 33. That year’s cutting-edge cinema, like Monterey Pop, Wild in the Streets, and Brian De Palma’s Greetings, reflected the new, rebellious youth culture; Elvis’s movies in 1968 were the innocuous, old-fashioned Stay Away Joe, Speedway, and Live a Little, Love a Little. Even worse, he hadn’t had a top 10 hit since “Crying in the Chapel” in 1965. Parker envisioned Presley’s comeback program as a Christmas special. Binder, however, wanted to leave that material to Andy Williams or Perry Como. He suspected that by making creative demands, Parker was merely trying to exert his influence over Presley—especially in front of those who would challenge his power. “He knew he had the goods. He had Elvis Presley, which nobody else had,” Binder said. But Binder still managed to win the singer over. When Parker called a meeting to insist that the special contain at least one Christmas song, for example, Presley sided with his manager to his face—but once outside his office, he jabbed Binder in his ribs and said, “f*** him.” And ultimately, Binder did not film any holiday material—though Elvis did perform “Blue Christmas”during one of his acoustic sessions. The meat of Elvis is its raw and intimate sessions in front of a rapturous audience. In the improvised so-called “Sit Down” sessions, he jokes, reminisces, and plays the hell out of his 50s hits, accompanied by his original guitarist and drummer, Scotty Moore and D. J. Fontana, as well as friends Alan Fortas, Charlie Hodge, and Lance LeGault. In the “Stand Up” sessions, in which he is accompanied by an offstage orchestra and singers, he is, at times, photographed from above, giving the appearance of a boxer in the ring. Elvis was a huge success when it aired in December, attracting 42 percent of the television-viewing audience and ending 1968 as NBC’s highest-rated show of the year. “If I Can Dream” made it into Billboard’s top 15, and the soundtrack entered the top 10 and was certified platinum. “The Comeback special makes the turn into the last phase of this career,” Doll agreed. “It is the beginning of what people call Vegas Elvis. Everyone associates Vegas Elvis with the gaudy jumpsuits and being overweight and sweaty. . . . That’s not true. It was the 1973 television special, Aloha from Hawaii,” that appeared to be the start of his physical and creative decline. Doll blames this in large part on his unhappiness at the dissolution of his marriage to Priscilla, whom he had wed in 1967. The marriage officially ended in October 1973, after the acceleration of his prescription-drug use (amphetamines, barbiturates, and tranquilizers). Binder witnessed Elvis’s resurgence and decline firsthand. On what would be the last night he would ever speak with the star, Binder invited him to a pizza and beer party at Bill Belew’s apartment. Presley, emboldened and invigorated by his work on the special, announced to Binder that he would no longer sing a song or accept a script that he did not believe in. He then gave Binder a piece of paper with a number on it, and told him it was the only way he would be able to reach Presley. When Binder eventually called, a voice told him he had the wrong number. Binder blames his battles with Parker over the content of the special for making him persona non grata in Presley’s life. Great. Now everytime I watch the 68 special, I gotta think about Elvis jizzing in his leather suit. Yeah I feel like the 3 dvd set is all you need from that special. The Aloha special was shown on german TV yesterday. Here's a link under which you can watch it until Sept. 12th. Sony will a release a 5-CD/2-Blu-ray box set to commemorate the 50th anniversary of the 1968 TV Special in November 2018. - Original Special included spirited "sit-down" performances with Elvis and original band members Scotty Moore and DJ Fontana plus then-new material, including the classic "If I Can Dream"
I'm treating my Elvis obsessed sister to a whirlwind trip to Memphis and Graceland next week, with a stop in Tupelo on the way. Drive up Monday, see what we can Tuesday, and drive back on Wednesday. Any tips from those who have gone there in recent years would be appreciated. Well, we went to Graceland today. I somehow thought the house would be bigger. But maybe I thought that because only the basement and first floor are open to tours. The second floor, which includes Elvis' bedroom, is off limits. His parents' bedroom was decorated by Gladys. I liked the little poodles on the wallpaper in the bathroom - don't know how Vernon felt about them lol. With all the talk about the Jungle Room, I thought it would be huge, but that wasn't the case. The television room had three televisions lined up next to each other. Thus he could monitor what was on the three networks back in the day. The TVs were playing clips from movies or TV. I didn't recognize the one on the left. In the middle was a classic by young George Carlin as the Hippy Dippy Weatherman on the Johnny Carson Show. On the right was a scene from Dr Strangelove featuring Colonel Mandrake and General Jack D Ripper. Toured the rest of the grounds, and really enjoyed the Meditation Garden. It was truly peaceful. All in all, it was a great experience. And best of all, my Elvis obsessed sister was "over the moon." Will drive back home tomorrow. Will listen to some Elvis gospel music, along with recordings by the Million Dollar Quartet. To add: it's a self guiding tour using an iPad and earphones . Commentary by our good buddy John Stamos. The new album features 18 recently unearthed and unreleased tracks from the recordings that Campbell made for Elvis between 1964 and 1968. Elvis Presley was regarded as an icon of the 20th century, and was often referred to as "the King of Rock and Roll." Presley is one of the most celebrated and influential musicians of the 20th century. Premieres October 16th on AXS TV! We are beyond thrilled to be able to offer our seatfillers this “Once In A Lifetime Opportunity” to be a part of this “All-Star Tribute” to the King of Rock -n- Roll, Elvis Presley. We are looking for a very special audience, yes, we said audience, as you will be seated and not have to move around, as you will be the audience on this one. This show will take place over a 2 night period, Wed, Oct 10th & Thurs, Oct 11th and you can sign up to attend either night or both nights, but you will need to submit for each night separately. We are recreating the Elvis 68 Comeback Special for this very intimate, in the round experience, and all of the audience will be up close and personal with all of the performers and we want you to be there with us. Many of you will even be sitting on the stage, at the feet of the talent as they sing and dance. Note: In order to be a seatfiller you must be able to move around freely without the need of an assisted walking device nor be confined to a wheelchair. You must also be able to stand for periods of time and walk up and down steps. So, get all of your friends together and submit your request now at http://www.seatfillersandmore.com to be there, and get up close and personal with your favorite celebrities during these 2 special nights of great fun and music. We will start sending out confirmations later this week and remember, there are 2 nights to choose from, or you can come to both, but only sign up if you know for sure you can attend. This is a casted audience and we are only looking for those between the ages of 18-34 or who look to be those ages for this special event. We are recreating this very popular Elvis Special from back in the day and we need the audience to match the ages that were in that special during that time. Powered by SMF 1.1.21 | SMF © 2015, Simple Machines Page created in 0.369 seconds with 21 queries.